About 33 years after the death of Raghu Nayak who showed exemplary courage in capturing Mahatma Gandhi's killer Nathuram Godse, the Odisha government on Wednesday provided a financial assistance of Rs 5 lakh to his widow. Chief Minister Naveen Patnaik handed over the cheque to Mandodari Nayak and felicitated her by presenting a shawl at the secretariat in Bhubaneswar. She was accompanied by the collector of Kendrapara district and her family members. The financial assistance was given to Nayak'w widow from the chief minister's relief fund, officials said. Raghu Nayak was awarded Rs 500 during his lifetime for his extraordinary courage by former President Rajendra Prasad. The state government, according to the chief minister's office, decided to provide financial assistance to Nayak's widow after it came to know about her financial hardship. While Nayak had died in 1983, their son also passed away some years later and Mandodari now stays with her daughter. Raghu Nayak, a resident of Jagulaipada village of Kendrapara district, was working as a gardener at Birla House in Delhi where Godse had opened fire on Gandhiji on January 30, 1948. 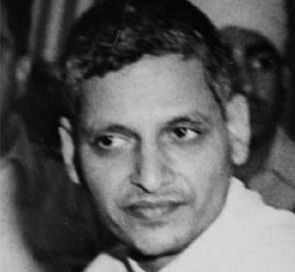 Though he could not save the leader, he was the first to chase down Godse and overpower him. Later, Godse was awarded capital punishment. The residents of Jagulaipada erected a memorial pillar in Nayak's memory in 2005 with assistance from German automobile maker Daimler-Chrysler. Nayak's family members and residents of his village lament that history has failed to give the brave man his due. "History books are almost silent on him. Nowhere can you find the mention of the person who tried to save the life of the Mahatma. We believe he deserved recognition by his countrymen," said Maheswar Das, a schoolteacher. The only book where Raghu's bravery finds a mention is 'Mahatma Gandhi - The Last Phase', a biography of the Father of the Nation written by his private secretary Pyarelal.